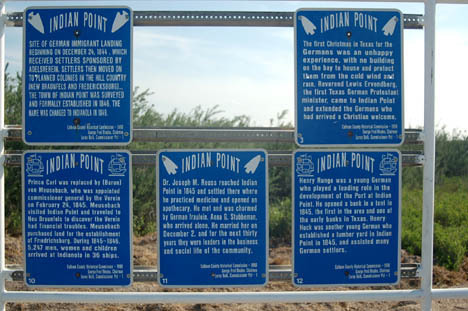 At Indian Point there are six racks of signs recounting its rich history. The signs depict a chronological history of Indian Point and Indianola, however, the signs are somewhat out of order. To read them in sequence requires quite a bit of driving and most probably don't notice anyway. Here the information is displayed in order. Site of German immigrant landing beginning on December 24, 1844, which received settlers sponsored by Adelsverein. Settlers then moved on to planned colonies in the Hill Country (New Braunfels and Fredericksburg). The town of Indian Point was surveyed and formally established in 1846. The name was changed to Indianola in 1849. (1) (2) Missing as of 4/06. The first Christmas in Texas for the Germans was an unhappy experience. With no building on the bay to house and protect them from the cold wind and rain, Reverend Lewis Ervendberg, the first Texas German Protestant minister, came to Indian Point and extended the Germans who had arrived a Christian welcome. On Christmas Eve a small tree was decorated. Gifts were presented to the children. On December 25th, 1844, the first Holy Communion service on the land that was to be Indianola was led by Evangelical Lutheran minister Rev. Ervendberg. These families were the vanguard of thousands of Germans to Texas for the next three decades. (4) On Powderhorn Bayou, 3 miles southeast of Indian Point, a storehouse had been rented for the Verein's property. Prince Carl and Samuel A. White did all they could to ease the problems of the German immigrants stranded at Indian Point. Prince Carl had a two story frame building erected. He then referred to Indian Point as Carlshaven. (5) The first immigrants were to remain at this location subject to ever changing elements and the attacks of the Gulf Coast mosquito. The immigrants remained under these conditions for several months before property for a permanent inland settlement was acquired and transportation could be provided. Johann Swartz and family decided to remain and purchased land and erected a house.